It’s always interesting to perceive the atmosphere of another country, another cultural and mental space. You are leaving the frames of usual life, which is obvious, and that make you existentially more opened. You feel awaken and must be more attentive, because surrounding is unknown. It gives the opportunity to feel better your own being, your presence in culture and in nature, and so to understand the gist of yourself. I was lucky to have such an experience from my childhood, when I was with my mother in India. It was many years ago, but I well remembered Auroville – an international settlement on the South of India, near the Indian ocean, where people are going for the spiritual experience. They try to build a new model of life. India today attracts many people. It is charming like as cultural and in the same time very natural country, keeping her ecology, developers very actively, but still not becoming technocratic civilization ("dead civilization", as O.Schpengler said in his book "Sunset of Europe"). In spite of globalization processes, when many countries copies American way of life and thinking, India develops its own mode of life, keeping alive thousand-years spiritual traditions. Western people often can't understand, how can this agricultural country, with still manual technologies and a milliard population, take foremost world positions (for example, in computering). Economical science acquainted to measure level of life of a country by production of material things for a citizen. But another measure is possible: the feeling of human happiness. In India it's very high, and of course it's highest in spiritual centres, in ashrams, for which mother India is the ground. 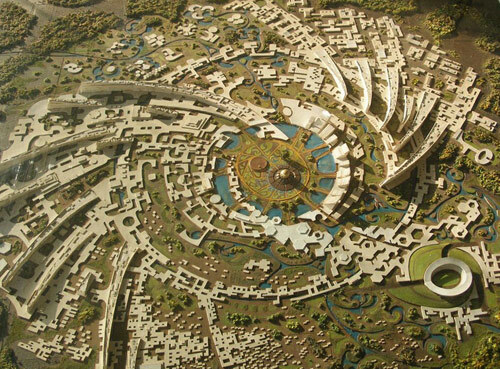 I'll tell some words about Auroville. It was built in a spiral form of Milky Way – reminding, that human life should reflects cosmic life. With such idea towns were constructed in ancient times: for example, Babylon, intended to copy the organization of the Universe by gods. But it's a very modern idea - to perceive human being as a part of Cosmos, in which the whole Universe is reflected. The Universe is infinite, so the human life must ever overcome the death. 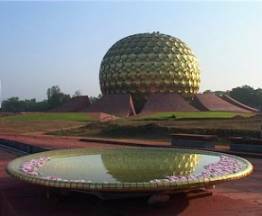 That's the main idea of Shri Aurobindo, by the name of which Auroville is named. The centre of Auroville is Matri Mandir – a temple in the form of golden dodecahedron, as it appeared in dream to his close helper Mother Mira. 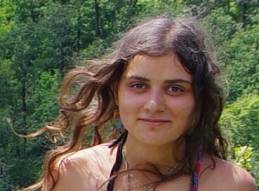 She was a French, but had taken her name from an Indian devotee and consecrated her life to spiritual transformational process. According her project, the temple is in the park with the word: "Silence", as transformational process should take place in a calm. The hall of meditation has a form of a white globe – like an egg, where the future life must be born. The excellent acoustics creates an impression of vacuum, where the new Universe is creating. Near the entrance a security was, they didn't wanted to let me to go inside, as it wasn't permitted to children to go into the meditation hall. But my mother said that I had an experience of meditation, and they at last allowed. I perceived there some dual feeling: from the one side, peace and plentitude, giving by the energy, on the other – inner disturbance of moving, like a sense of unknown or a question, which is born from an answer. It was like an opening eyes for a moment – m own opening of my own eyes, but the accent was not on myself, but on this answer, from which the question had been born. I think, my consciousness was awaken for the moment, that's why I remembered it. Now, by philosophical language, I can say, that philosophical task of travels is to throw us to the other conceptual fields, from reality which is obvious for us -- to another reality, which is obvious for the place that we are visiting. So we can check our philosophical ideas and compare our world view to another one, and to find new answers to the fundamental philosophical questions. As well as practical: everybody knows the Indian conception of policy – non-violence. Or from the spiritual point of view, that we can understand in Indian ashrams, another relation to the question of the health arises – don’t concentrate on the illnesses, which are the obstacles of energy, but on the spiritual development that gives the moving of energy and helps to overcome them. In India there are many alternative models of spiritual settlements. In any part of India you can meet ashrams of different spiritual directions. The ashram Aurovalley in foothills of Himalayas, that I also visited, develops teaching of Shri Aurobindo's and Mother Mira. It's important, that different teaching in India don't compete. They looked to one direction: they are forming models of the future life and relationships. And I would want to go to India in more conscious age, with some our students who are interested in India like me, to see way to the future through them.